Jakarta Library and Archive Dept. (Dispusip) held discussion with theme "Gerakan Pembudayaan Kegemaran Membaca di Provinsi DKI Jakarta" (Movement to Improve Jakartans Interest in Reading) at Jakarta Public Library's Auditorium, Taman Ismail Marzuki, Cikini, Central Jakarta, Thursday (11/29).
" 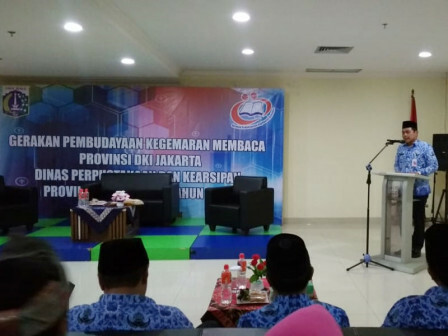 Its output is clear; about ways to increase Jakartans interest in reading"
Jakarta Dispusip Head, Wahyu Haryadi stated, discussion participants were literacy activists from Taman Bacaan Masyarakat (TBM) in Jakarta. Reviews, critics and input in this discussion will be references for Jakarta Dispusip to plan the next programs. "Its output is clear; about ways to increase Jakartans interest in reading. Thus we will collaborate inputs that we received in this discussion with Jakarta Dispusip programs," he conveyed. All this time, he continued, his department has been trying to grow Jakartans interest in reading, especially children. For example is by providing reading corner in Children-Friendly Integrated Public Spaces (RPTRA)s. There is also mobile library with 'jemput bola' service that provides reading facility for children in settlements or strategic areas. "In order to educate people and increase community's interest in reading, not only Dispusip's role is needed but also community support," he assessed.